1.) 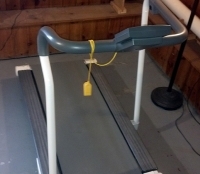 Disconnect the treadmill from power, then lift the treadmill on one side, keeping the left side where the drive belt is located lifted up. 2.) Unscrew the cap at the end of the front roller by removing the three screws. The cap opens in two sections. 3.) Remove the engine cover by removing seven screws. 4.) 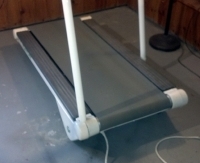 Unscrew the four screws holding the motor mount, then loosen the tensioning bolt so that the motor and the engine bracket can be moved significantly to the front of the treadmill and the drive belt can be removed. 5.) Remove the screw from the front roller shaft so that the front roller can slide out of the frame. 6.) 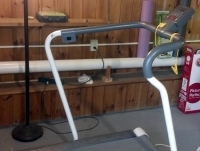 Loosen the two bolts in the back of the treadmill until the left side of the roller can be removed from the treadmill's frame, so the old belt will come off and the new one may be installed. 7.) 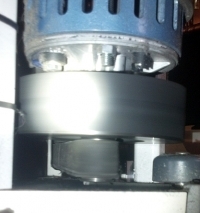 Reverse the procedure once the new drive belt is positioned. If the belt is tightened properly you should be able to rotate it by about 90 ° by hand. If you can’t rotate, it means that it is too tight, and that’s not good for the motor and for the belts itself. If it is too loose, it will slip on the roller pulley. 1.) In addition to steps 1 through 6, remove the two caps from the end of the rear roller. 2.) Remove the two bolts from the rear roller and remove the roller by sliding it out underneath the belt. 3.) Remove the rear cap from the left side and slide the footrest forward and out of the tap. To ease the operation loosen the nuts located at the bottom of the deck. 4.) Remove the screws that secure the deck to the frame using rubber bearings. 5.) Remove the old belt from one side and insert the new belt by sliding it. 6.) Reverse the procedure, including all the steps in the transmission belt section. Once everything is fitted, tighten the rear roller bolts following the instructions in this blog for calibrating, centering, and tensioning the belt.